Ducks lost for the first time in December and missed a chance for a club-record, seven-game winning streak on the road. 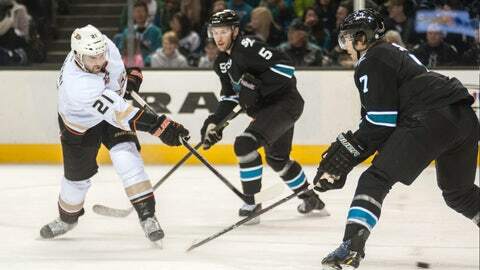 Bracken Kearns scored his first NHL goal, Logan Couture netted his 100th, and the San Jose Sharks broke Anaheim’s 10-game winning streak by beating the Ducks 3-1 on Sunday night. Burns has eight points in his last seven games against the Ducks. The Sharks scored in the first 90 seconds of a game for the ninth time this season. NOTES: The Sharks have taken a 2-0 lead in the first period 14 times this season. . Sharks C Tommy Wingels left with an apparent leg injury during the first period. . The Ducks haven’t scored on their past 21 power plays. . Sharks C Joe Thornton recorded an assist to move into a 25th-place tie with Alex Delvecchio (825) on the NHL career list.